Washed Gesha goes through a mechanical demucilager, soaked for 24-36 hours and then shade dried to 30 percent moisture content.It is then transferred to a raised African bed for further drying before it is bagged and stored for export. Lot 14(WHQ-G1-14):With hints of peach and cranberry, Lot 14 scored 87 points for its tropical profile.Smooth with light florals notes, this Gesha lot is easy on the palate. Lot 21(WHQ-G1-121):With a burst of aromatic fruits, Lot 21 scored a high of 87.5 points during CCS cuppings in both North American and Europe with everyone noting the cups sweetness even as it cooled.Reminiscent of baked pears, this Gesha lot is elegant and complete. Lot 32(WHQ-G1-32):A welcome to late Summer/ early Autumn, Lot 32 scored in at 87 points and is full of deep red berries and apricots.The mouthfeel of this washed Gesha is full and lingers pleasantly after each sip. Lot 123(WHQ-G1-123):This lot scored a high of 87 points for its transparent qualities.With very subdued acidity levels, the introduction of Lot 123 from Gesha Village offers a melange of cooked berries.Blackberries and lingonberries are very prominent and has a clean finish. The Gesha Village journey began back in 2007 when Adam Overton and Rachel Samuel were making a documentary about Ethiopian coffee for the Ethiopian government. It was during this project that they were first introduced to Dr. Girma, their guide through the Gera Coffee Forest near Jimma. Dr. Girma is a coffee researcher and is a wealth of information about coffee agronomy, and farm management. During the process of creating this documentary, Rachel was reintroduced to her birth country and Adam became fascinated by the rich coffee history of the birthplace of coffee. By the end of this coffee expedition, the couple felt compelled to start their own coffee farm. They saw too much unexplored potential and opportunity in Ethiopia’s wild coffee forests to ignore. Even though the country’s coffee trade was established long ago, Ethiopia’s coffee sector as a whole is far behind newer coffee origins in terms of agricultural and processing innovations as well as terroir distinctions, which these days are two of the most important distinctions between specialty and commercial coffee. Adam and Rachel are fully utilizing this gap in the Ethiopian specialty market in establishing Gesha Village Estate. As they surveyed place after place, they drew further and further away from Addis. Finally, they found Gesha town, very close to Ethiopia’s border with Sudan, in the far western region of the country. During their reconnaissance, they found wild coffee growing within pristine forest. This coffee paradise, combined with meeting some inhabitants from the Meanit community who indigenous to the area, also drew the couple in. This was a place and people where something completely cutting-edge could happen. In autumn of 2011 the lease for the 471 hectares that now make up Gesha Village Estate was signed and soon after, Akalu, Gesha Village’s (GV) Farm Manager was hired. He, together with the newly established GV team, began doing a forest exploration where they picked wild seeds from the nearby Gori Gesha forest. After a year in the nursery, these seeds were planted on 30 hectares and at the same time, the team began acquainting themselves with the Meanit neighbours that lived around them. This initial 30 hectares made up GV’s first “test plot” – the team wanted to ensure the cup quality was good before more coffee was planted. The first 1kg sample was sent to Adam and Rachel’s friend Willem Boot in the spring of 2012 even before they themselves had a chance to cup. Willem in turn organized a Cupping Caravan in Ethiopia where cuppers were blown away by the coffee. At this point, the GV team knew that they were onto something special. Before getting too ahead of themselves, the team decided to visit their neighbours’ coffee farms in order to both study the morphology of more established trees, which also came from forest seeds, and also to cup their neighbours’ coffees to further understand what they were working with at GV. As exciting as cultivating forest coffee was, the team understood that planting one of any variety was risky and on the advice of Akalu and Dr. Girma, decided to plant a good portion of GV with tried and tested Ethiopian heirloom varieties released from the Jimma Argicultural Research Center (JARC). These released varieties come from various seed collection expeditions that JARC has conducted. Wild varieties collected during expeditions are studied and researchers are looking for the following characteristics in determining which are “superior plants”: a) showing disease resistance; b) excellent cup quality; and c) good yield. Plants showing these characteristics are chosen for release and GV chose to plant a variety that originated in the highland coffee forests of Illubabor. This one showed both disease resistance and excellent cup quality. We can say that over the course of cupping the different varieties produced on GV, these research varieties have some of the most exciting cup profiles that Gesha Village have produced. With varieties playing such an important role in quality and cup profile, it makes perfect sense that the GV team found research partners to carry out a methodical genetic study on the Gesha forest varieties. Part of that study concerns the possible connection between Panamanian geisha and coffee from the Gori Gesha Forest. You can access the study’s findings here. Before the project started in earnest, the GV team gathered the elders and wise men from the local Meanit community in order to explain the project as well as hear out the community’s thoughts and concerns about it. Though successful as an introduction, the team understood from the beginning that a real partnership would take time and effort and one of the early challenges GV faced was finding labourers. There was a stigma against working for someone else as most people already had their own garden farms. Over time, women began working with the farm and since they earned their own income for the first time, this early labour force attracted more and more people, eventually both women and men. Today, GV can attract up to 800 workers per day coming from 17,000 families. 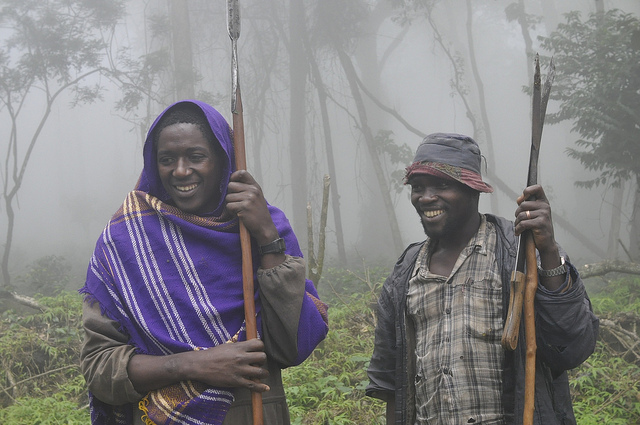 These workers come from 5-6 different kebeles (localities) spanning from Gesha Mountain to Gori Gesha Forest. Now that a good relationship has been established between Gesha Village Estate and their surrounding communities, three local representatives have been appointed to liaise between the farm and its neighbouring communities. Nearby to Gesha Village are three government run schools and one clinic. These are all within a short walking distance from the estate and this is significant as in rural Ethiopia, many students must walk up to three hours in order to get to school. Gesha Village provides school supplies to students and is currently working with the clinic in order to figure out the best way to support its operation. One other community project that the GV team is focusing its efforts on is distributing fuel efficient and cleaner burning stoves to their neighbours. Most households currently use outdated stoves that require lots of wood/fuel and burn a lot of waste particles into the atmosphere. For the past 3 years GV has given away 25,000 coffee seedlings per year to neighbouring farmers. The team also provide agronomy training when the farmers pick up their seedlings. GV hopes to grow coffee production in the surrounding area so that local farmers can grow benefit from the innovations employed at GV. On the botanical side of the spectrum, the GV team planted a research plot in early 2016 that is made up various of indigenous coffee varieties. This will allow the team, including Dr. Girma, to better study varieties. The team is keen to continue partnering public/educational partners to carry out future research that will add to the knowledge they’ve already accumulated from the genetic study they worked on in 2014 with Dr. Sarada Krishnan from Denver Botanic Gardens (mentioned earlier). In addition to coffee, GV is currently testing apple and honey cultivation. The motivation behind these two projects is mostly one of curiosity, but who knows where things will lead? The GV processing facility is upgrading to a custom-made Penagos pulper, which will be installed in 2017. This pulper sorts under and overripe cherries through water pressure and will help out the manual pickers, who sometimes find it difficult to pick the different plots which are planted with different varieties and hence have different morphology. Finally, the team is researching how to build a warehouse on-site. They have found a potential supplier but given the poor road conditions between Addis and Gesha, the logistics for getting the materials to the farm first needs to be solved. Team CCS is proud to have the distinct honour of being the only coffee importer in Europe and the US to be working with Gesha Village Estate. While Adam & Rachel and their team do run direct sales with roasting partners, both CCS & Gesha Village saw an opportunity to work together to further distribute Gesha Village coffees to great homes around the world. Both projects share similar values in promoting excellent coffee while building a transparent and a partnership-based buying community, so it made sense to join forces in the effort to spread the coffee and word about the phenomenal work of Gesha Village Estate.